The Na metal batteries can deliver better cycling performance after air exposure of its electrolyte, overturning the common notion that air exposure should always be avoided during battery assembly, according to a published research paper by the University of Michigan ─ Shanghai Jiao Tong University Joint Institute (JI) Professor Shouhang Bo and his partners. The paper titled “Rectivity-guided interface design in solid-state Na batteries” was published in the January 2019 edition of Joule, a flagship energy journal of Cell press. As one of the corresponding authors, Professor Shouhang Bo proclaimed an innovative strategy of protecting sodium metal in solid-state batteries. The protection was done through a simple step of air exposure, which is commonly thought as a terrible move when making batteries. The lead author of this paper is Yaosen Tian, a fourth year graduate student of the University of California, Berkeley. The corresponding authors also include UC Berkeley’s Daniel Tellp Distinguished Professor Gerbrand Ceder, who is also a member of the American National Academy of Engineering and Senior Faculty Scientist of Lawrence Berkeley National Laboratory. Compared with lithium batteries, sodium (or Na) batteries employing heavier and bigger elements are considered inferior in terms of energy density. This results in major drawbacks, such as short working hours and driving range, in everyday applications. However, Na batteries are cheap, because the chemical elements used in such batteries are much more earth abundant and evenly distributed than those in lithium batteries. Na batteries are, therefore, a major contender to lithium batteries in large-scale applications, such as grid-level stationary energy storage. When flammable liquid electrolyte is replaced with nonflammable ceramic electrolyte together with the use of an energy-dense Na metal anode, the energy density of such Na batteries (or termed as solid-state Na batteries) can be substantially improved over currently available Na batteries in which a hard carbon anode, a liquid electrolyte, and a transition metal oxide cathode are used. Solid-state Na batteries provides a low-cost, high-energy-density and ultimately safe solution to the ever increasing demand of energy storage. Unfortunately however, Na metal shows reactivity against liquid and solid electrolyte, air and water, causing a sharp decrease in cycling efficiency of Na batteries. 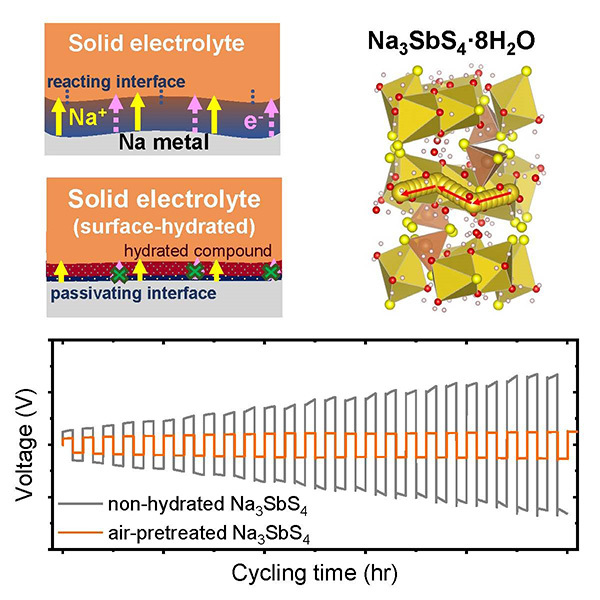 The published Joule paper has shown unexpectedly that a solid-state electrolyte, Na3SbS4, exhibits even better cycling performance after air exposure when used in Na metal batteries. This finding overturned the common notion that air exposure should always be avoided during battery assembly, and proved that optimal duration of air exposure can in fact improve battery cycling performance in certain systems, leading to an unprecedented route toward solid-state battery interface design. Through a combination of ab initio density functional theory calculations and synchrotron X-ray depth profiling measurements, the researchers further reveal that the secret lies in the formation of a protective hydrate layer on top of Na3SbS4 surface after air exposure. This layer reacts beneficially with Na metal, forming an ionically conductive passivating interface. Co-authors of the paper also include Yingzhi Sun and Yihan Xiao of UC Berkeley, Daniel Hannah of Berkeley Lab, Hao Wang and Karena Chapman of Argonne National Laboratory. The research work was supported by Samsung Advanced Institute of Technology. Shouhang Bo is a tenure-track Assistant Professor of the UM-SJTU Joint Institute. He received his B.S. degree in Chemistry from Fudan University in 2009 and Ph.D. degree in Chemistry from Stony Brook University in 2014. 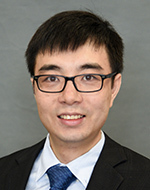 Before he joined JI in July 2017, Professor Bo was a postdoctoral fellow at Department of Materials Science and Engineering, Massachusetts Institute of Technology, and Materials Sciences Division, Lawrence Berkeley National Laboratory. His recent research interests include material and system-level studies of solid-state materials for energy storage devices, and real-time spectroscopic and scattering studies of inorganic material synthesis.